With the coastal plain of Perth being so flat, cycling is an easy, cheap, enjoyable, all of the family recreational activity or for the growing number of commuters a fast, cheap, alternative than traffic gridlock and car parking. 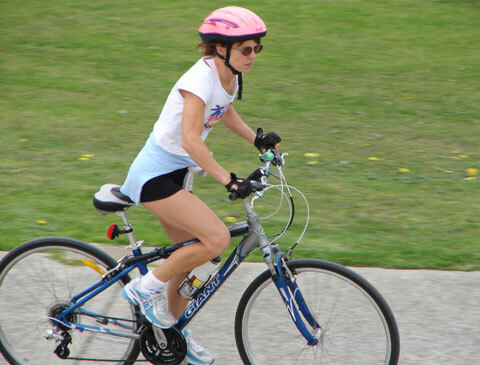 Improved fitness is also a benefit of cycling which uses the biggest muscles in the body. You can upload your Perth cycling videos to Perth Google+. 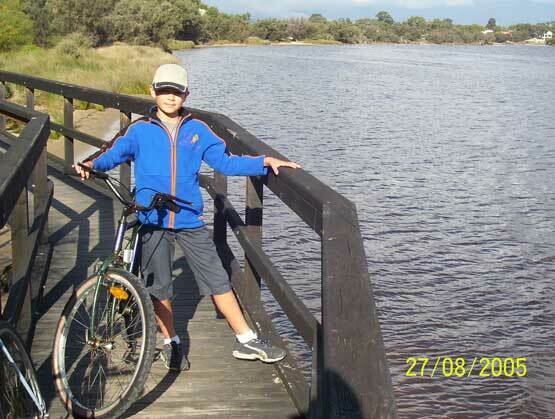 Cycling Perth's Swan River with Jon, my 9yo, inspired me to develop this Perth cycling website. I grew up bicycling Perth's hill suburb of Darlington. Cycled for transport most days on Aitutaki for a decade but after coming back to Perth, I began bike riding up and down Perth's Sunset Coast because it was less boring than the knee rehabilitation gym after 3 operations. The best bike thing was getting a bike rack for the back of my car. 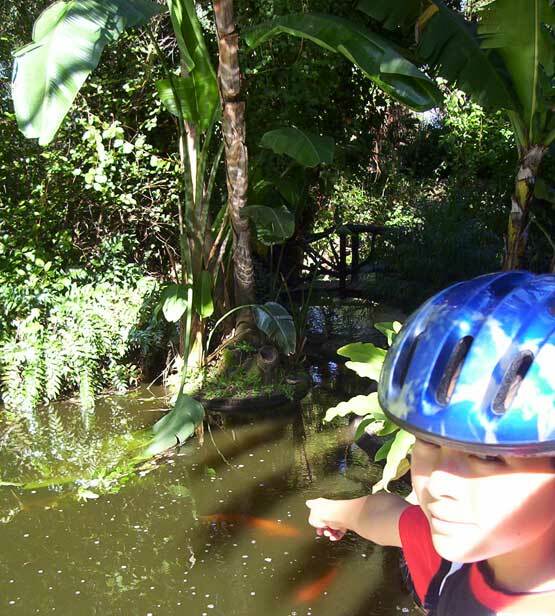 We soon figured that bicycling around Perth's rivers and lakes is flat, interesting and easy. I feel like a tourist in my home city of Perth. With the cold of winter making surfing Perth beaches less attractive, turning to bicycling has led to a discovery of how beautiful Perth waterways are. Perth Cycling Map 700kb PDF. Bicycles are not permitted on TransPerth buses but are permitted on Perth trains except for peak hour exclusion times. Trains travelling towards Perth between; 7:00am and 9:00am Monday to Friday. Trains travelling away from Perth between; 4:30 pm and 6:30 pm Monday to Friday. The biggest cycling tip for Perth cyclists is to buy cheapest used bicycles in Perth from the tip. Council/city recycling centre such as the City of Stirling's Recycling Centre, Balcatta, sell lots of cheap bicycles. We started bicycling near the Narrows Bridge, along the Esplanade of Perth's CBD, past the Causeway bridges, Windan Bridge, past Burswood, and along the South Perth foreshore. A shortcut is cycling over the Matagarup Bridge which opened in 2018. It makes cycling to the new Perth Stadium easy. 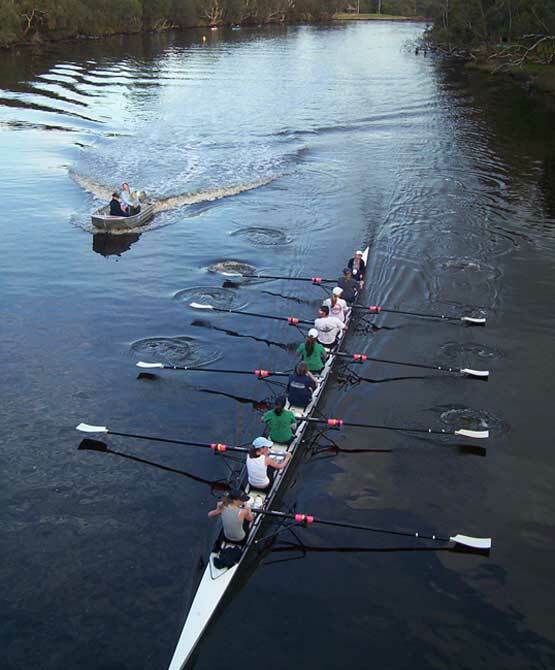 We started at the Mt Henry Bridge, Shelley Bridge, from Curtin University along the Canning River to Aquinas, and back to the Mt Henry Bridge. Living and working on the Sunset Coast, I never realised how beautiful south of Perth along the Canning River is. Bicycling over the Canning Bridge and along the Kwinana Freeway made me wonder why fit people would want to dive a car to commute to work in the Perth CBD? 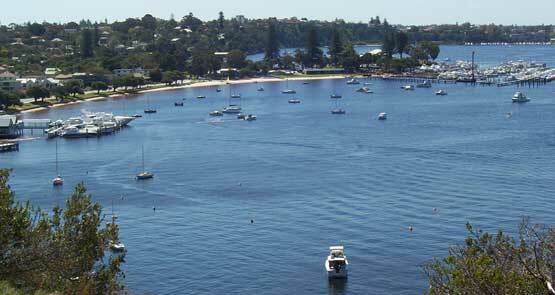 After surfing at Scarborough Beach this morning we ate a packed lunch on the north bank of Swan River at Claremont. Most of Perth's bicycling along rivers is flat though this view at Mosman only a few kilometres from the Indian Ocean is worth bicycling up. Cycling Fremantle streets was a very interesting cycling tour in this historic port city. More of our Fremantle cycling trip later. Perth bicycle routes away from busy streets from Fremantle to Perth were well sign posted. 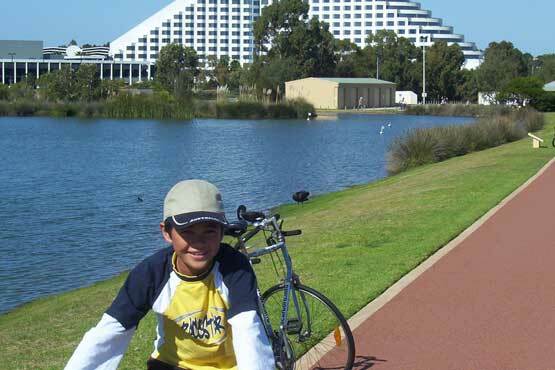 Cycling around Perth lakes such as Lake Joondalup and Herdsman Lake are flat and environmentally interesting. We consulted the Map of Perth, planned our trip with the regular strong sea breeze in mind. The boy with his 10 speed racing bike flew with the wind along the Melville foreshore south of Perth. After bicycling over the Narrows Bridge we turned west into the sea breeze for our last leg. 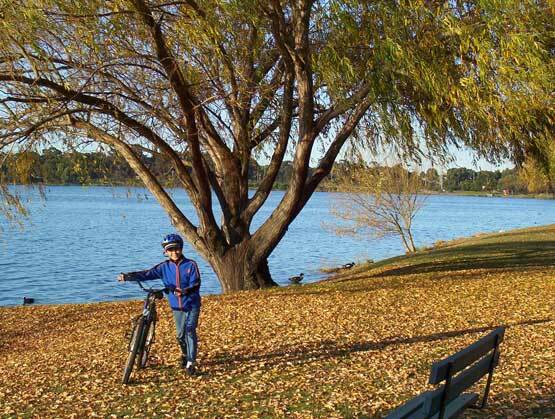 Bicycling Perth's Herdsman's Lake and Lake Monger: If you're looking for a short bicycle riding tour in Perth, Lake Monger 5km north west of the Perth CBD is flat and takes about 15 minutes cycling. Photo of Lake Monger I took in 1971. If you add nearby Herdsman's Lake to your cycling tour, add 40min. Above photos on the Sunset Coast cycle path. For us, living at the means frequent surfing and Perth cycling up the Sunset Coast to Hillary's Boat Harbour and south to Perth's City Beach. Like most of Perth's bicycle paths, it is dual access but bicycle accidents do happen so watch out for children and dogs. Dogs (gods spelt backwards): please keep your careless owners a short leash. 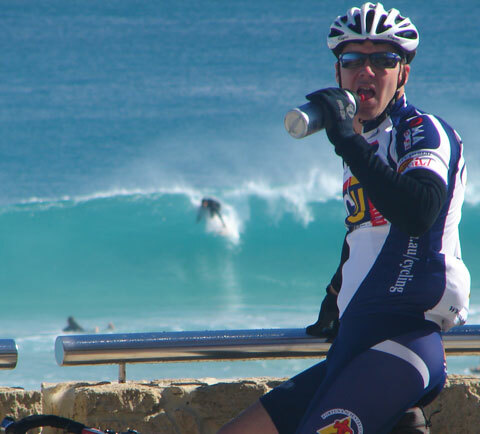 Not only is Perth bicycling fun and healthy but an environment and fuel and saver. 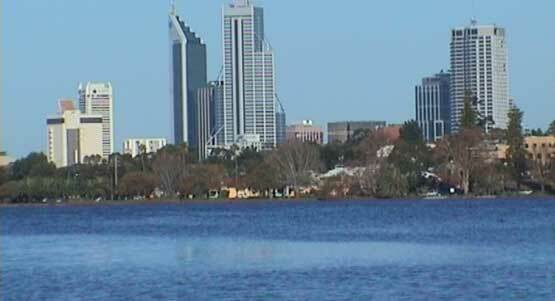 Drinking water fountains are available while bicycling around Perth rivers but bring money just in case. I find cycling through the much improved Perth bicycling paths is delivering empowerment to Jon and bringing back fond memories of cycling all over Perth in my youthful days. Cycling is also providing early practical road rules Perth training for cotton wool kids. 108,799,200. bikes are made each year. There are two-and-a-half times more bikes produced annually than cars. 87 per cent of global bicycle production is from China, India, the European Union, Taiwan, and Japan. 60 per cent of the world’s bikes are made in China but in Beijing, only 20 per cent of commuters rode bikes in 2002, compared to 60 per cent in 1998.
the number of bicycles sold in Perth Australia has outstripped the number of cars sold for nine consecutive years. according to the Australian Bicycle Council, the cost of buying and maintaining a bike is about one per cent of the cost of buying and maintaining a car. There is an estimated billion bicycles in the world, with nearly half of them in China. the Canadian Automobile Association calculated the annual cost of running a car minus the cost of a bicycle and estimated that if just half of the people who bought a bicycle within a year were able to stop using their car they’d have an additional $5,000-$6,000 of disposable income. (Australian Bicycle Council) say cycling just 10 kilometres each way to work instead of driving saves about $770 in transport costs and 1.3 tons of greenhouse gas emissions each year. (Australian Bicycle Council). Cycling in Perth not only saves Perthites money and air quality but also keeps you fit and healthy. Cycling groups and cycling clubs in Perth can contact me for a free link from this cycling webpage to their cycling in Perth website. Wonderful, flat 12km bicycling in Perth's Sunset Coast. Bicycling on Perth's flat coastal plain is good but the wildlife such as swans and long neck tortoises at lake Joondalup are a bonus. 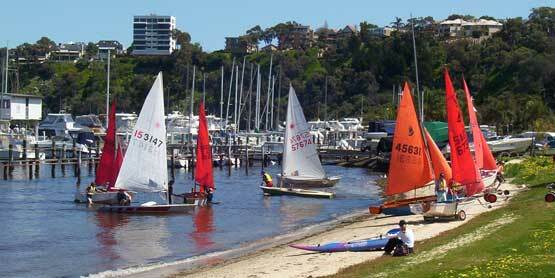 Perth is fortunate to have such a large public park, on a hill, so close to the central business district of Perth. 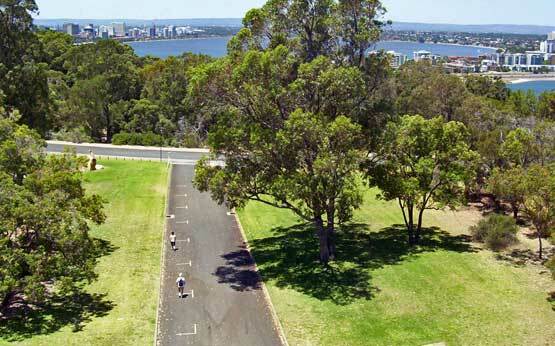 There are 2 bicycle routes in Kings Park. One easy riding the other hilly. Consult the free Perth bicycling map by BikeWest and the Department of Planning and Infrastructure. Available at many Perth bicycle shops. 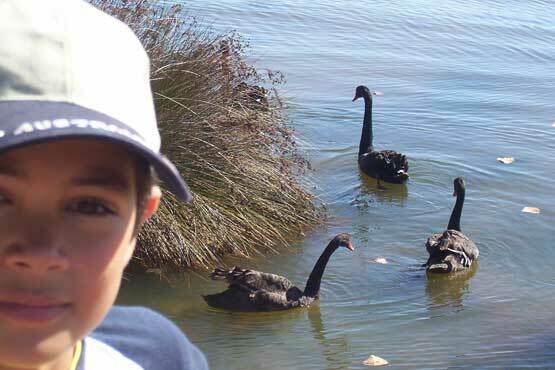 Cycling to Perth's Northern Lake Joondalup. Plan your cycling with the Google Map of Perth. 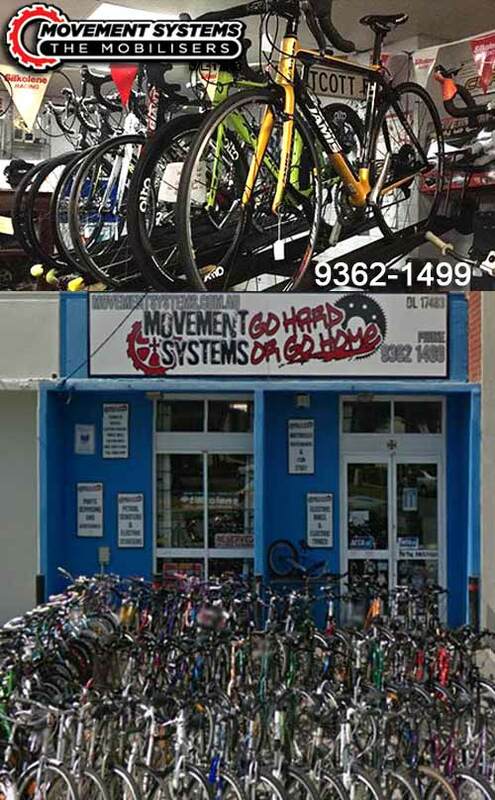 Digital Marketing for bicycle shops in Perth. Advertise cycling events in Perth and cycle shops including free VR photos Example Perth Bicycle Shop VR photo. There were many interesting stops bicycling from Fremantle to Perth. 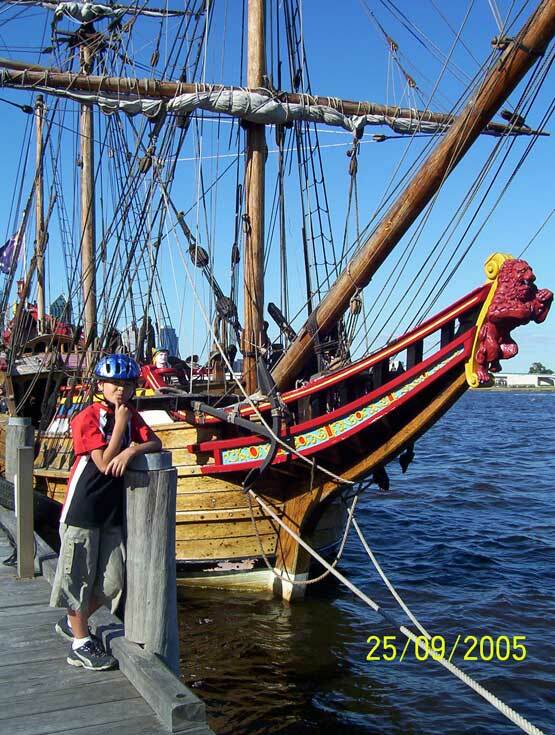 Sailing in the blood of my genetically Dutch / Polynesian son stopped us by the old Perth Swan Brewery where the 1606 tall sailing ship Duyfken was birthed. Fun family cycling round Lake Goollelal. Start your Swan Valley, (Perth wine region) bicycle riding trip at the information Centre in Guildford where you can get free bicycle touring information / maps. There are some very bicycle unfriendly sections without the quality bike paths the rest of Perth have.